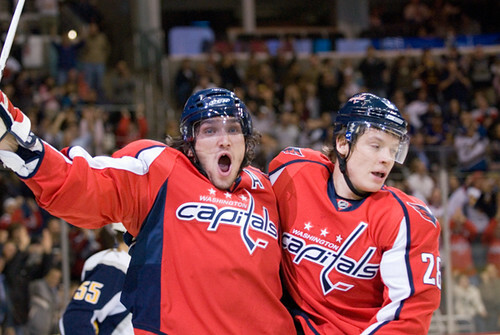 Home / Opinion / Ian’s Take: What Should The Capitals Do With Alex Semin? Can your favorite player on your favorite NHL Team do this? No. The answer is no. And if they’ve done it once, they can’t do it night in night out like Sasha can when he’s on. Some say Alex Semin is disinterested and inconsistent. To you I say, maybe we just don’t understand him. Maybe he doesn’t have the same goals we think he should have. Maybe he’s a loner, an opinionated, emotional guy. Maybe he has been shy with the media because he knows the only answers he has are generally truthful and shocking – which would be a distraction to the team. Maybe he’s not some Americanized NHL Player who says cliche after cliche, honed from years and years of watching SportsCenter learning what to and not to say. Maybe he only speaks through a translator to the media because he’s trying to be as careful as he possibly can with his words to protect himself. Maybe he’s done enough self-reflection to know that he can be immature and sound selfish. Honestly, nobody really knows and very few really get him. That’s why he’s the most polarizing player on the Washington Capitals and the most interesting. But there’s one thing I do get, after watching almost every game Alex Semin’s played in a Capitals uniform: he’s fiercely competitive. Semin wants to be the best. In the preseason, when he was asked what his aspirations were for the upcoming season, he said “Score more goals than Ovie,” in English, with a smirk on his face. Okay, jackass. But before he was interviewed, Washington Post reporter Mark Giannotto noticed he was meticulously studying his year by year statistics in an NHL Media Guide. Ah, the truth. He does care! The best way to understand Semin’s competitive nature is by examining the terrible mistakes he makes. His third period penalities in the offensive zone? Bruce hates them. Nobody really gets it watching at home. But what are they really? Are the penalties a lackadaisical, lazy hook or hold? No, they’re generally over-aggressive stick fouls where Semin’s trying to win a personal battle for the puck and goes a little too far. That’s passion and refusing to give up. That’s losing your composure and being young. That’s evidence that he needs to learn how to pick his spots better. Everybody tries to find the answers with Sasha, because everybody wants to know what they really have. But maybe Alex Semin isn’t meant to be understood. Maybe he’ll always be this off and on player. Maybe he’ll always take stupid penalities, sulk when he’s not playing on Ovechkin’s line and screw up simple things other marginal players do right every time. But I love him for his potential and his flair. I love him for the drama he brings to the team. I love him for his ability to completely take over games and even an entire playoff series. And as a ruthless hockey fan, I love the fact that I think the Capitals have the ability to sign him to an affordable long term deal that’ll probably be fair to both him and the team. Why do I believe this? He’s stated in interviews that he loves playing for the Capitals and hopes to be back. He’s best friends with Alex Ovechkin. Don’t believe me? Here, Here and Here. Warning: the Bromance level in these links might be overwhelming to most normal human beings. Sasha is a home grown player. I’ve seen him play his entire career here. I find him extremely likable, and though i don’t trust him in key situations sometimes, I can’t stomach the thought of him growing into what I think he could be on another NHL team. So I hope the Capitals resign him sometime this year before he’s a restricted free agent. I hope the Capitals keep him here with Ovie for the long haul. And I hope the Capitals have faith in the other players they’ve drafted like Karl Alzner, Semyon Varlamov & John Carlson to be the key elements of an offensive AND defensive minded team that wins a Stanley Cup in the foreseeable future.